Ad Quiz Movies & Random: Indian Telco Twitter Followers. Fake or Real analysis. The Quizzing, Advertisement & Movies Blog ! Indian Telco Twitter Followers. Fake or Real analysis. Now there are big claims everywhere. And social media is not an exception. When there is ego clash among friends to showcase who has more followers or his/her photo got more likes how can brand be an exception. After reading an article about fake followers of different politicians, I thought of a similar analysis of telcos. Telcos now a days fighting a cutthroat war in order to woo the customer. The same in the sphere of social media too. 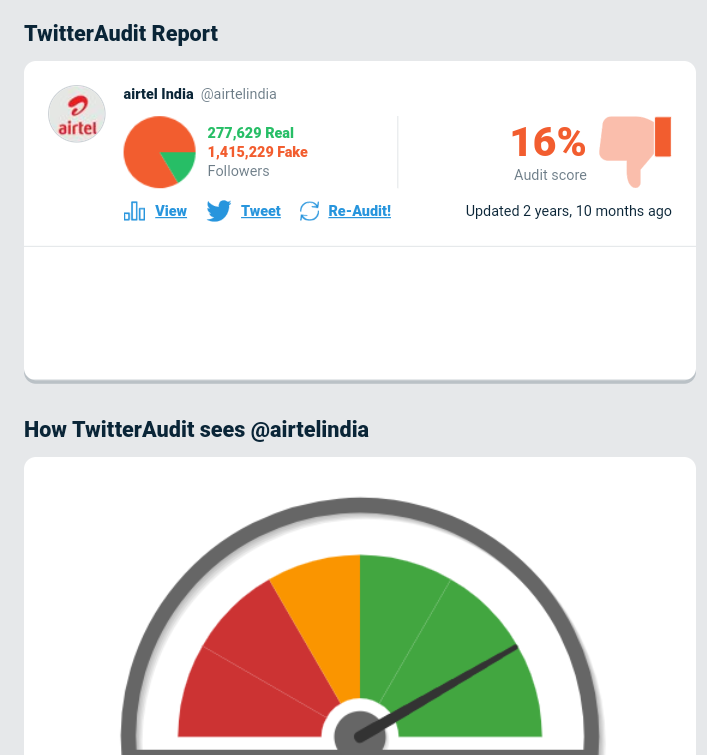 I did a twitter followers audit for 6 Telcos of India. 4 of them are big private telecom companies. And rest two BSNL and MTNL are Government operators. 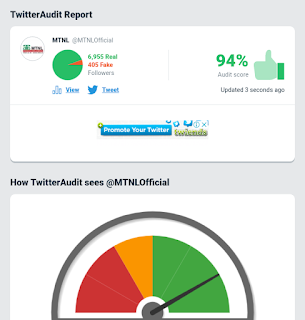 One of the operator has 94% genuine followers and another operator has 84% fake followers. Any guesses ? Let the data reveal the secret. 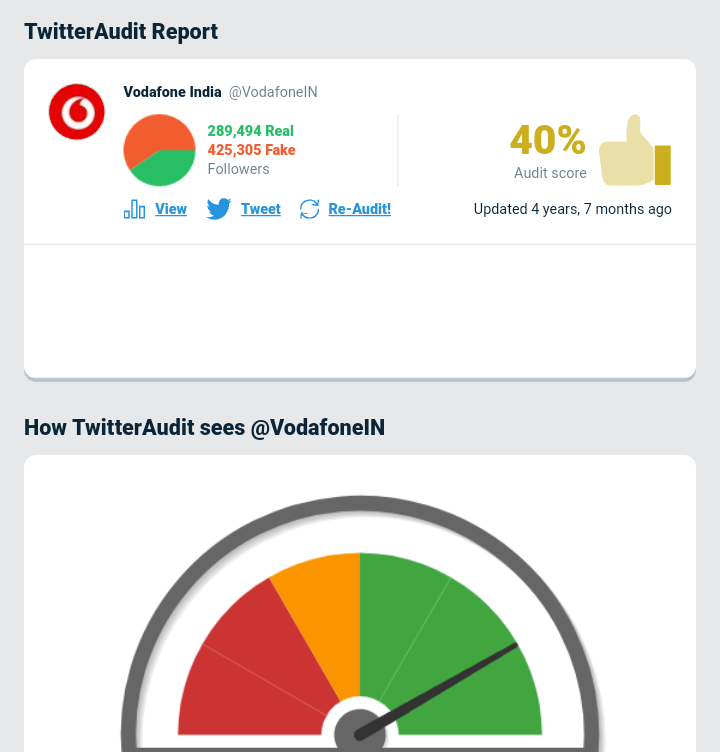 Vodafone India has a score of 40%. That means forty percent of the followers are genuine. 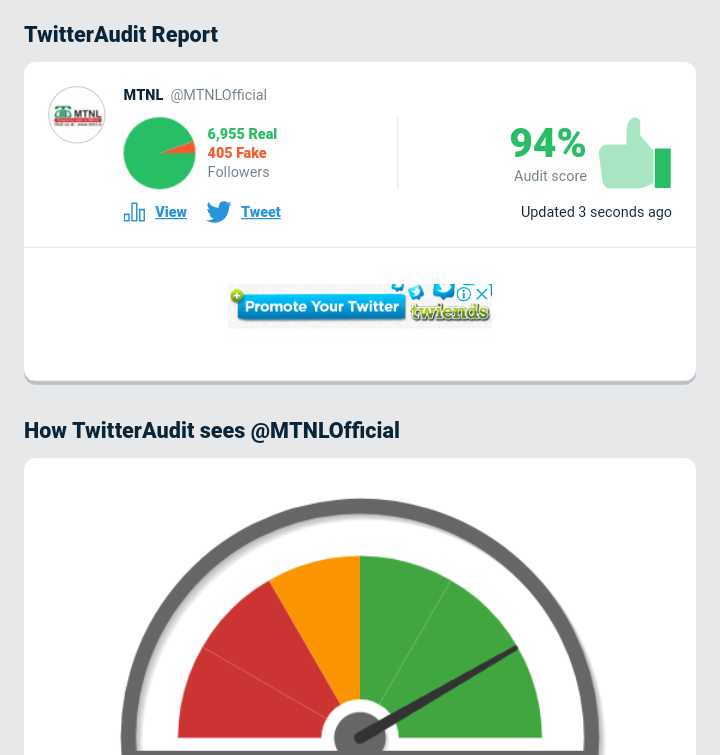 Rest sixty percent are fake followers acquired through buying bot accounts or website selling followers. 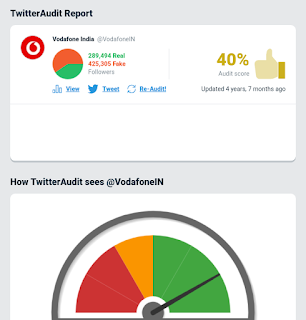 Idea who is merging with Vodafone has a score of 61%. So it's just the opposite of Vodafone. It has roughly 60 genuine followers for every 40 fake followers. Now comes the turn of Reliance Jio whom ether big three telcos are accusing of having unfair means. Let us check the allegations. It has a score of 85%. 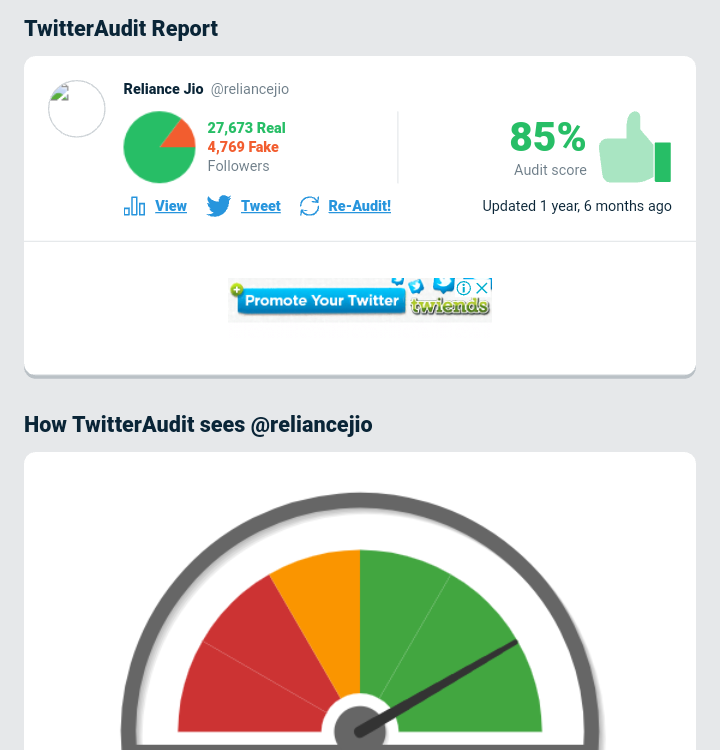 That means it has 85 genuine followers for every fifteen fake followers. Now let us check government operator Bharat Sanchar Nigam Limited, BSNL. It has a whopping score of 91%. It means it has 91 genuine followers for every 9 fake followers. Let us check the other Government operator, Mahanagar Telephone Nigam Limited ( MTNL). 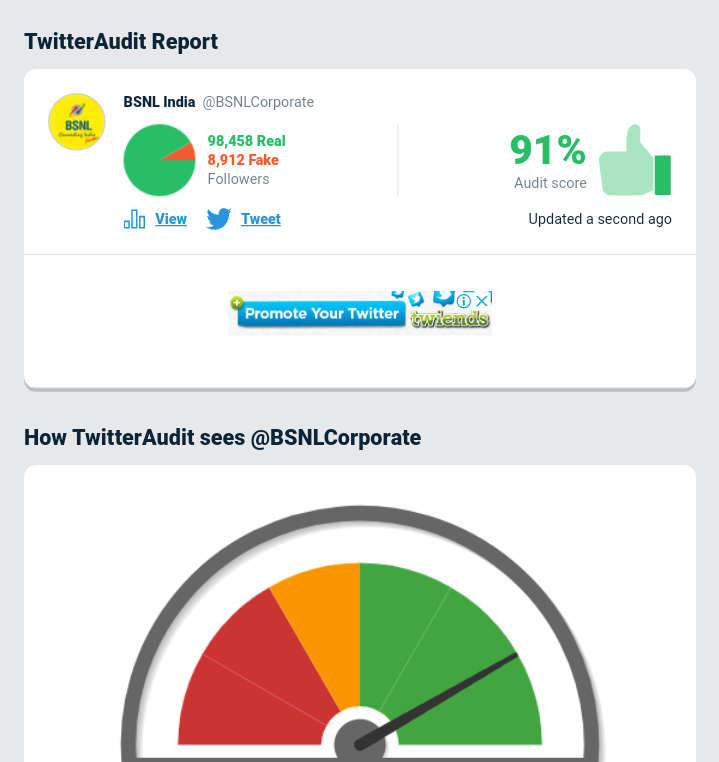 Surprisingly it has 94% genuine followers and only six percent followers are fake. So what makes these operator to resort to unfair means to increase followers in social media. Is there a need to increase followers ? Is it to create an impression that they are number 1. Hopefully the analysis will force these operator to rectify their mistakes. And big kudos to MTNL, BSNL & Jio for playing the game fairly. 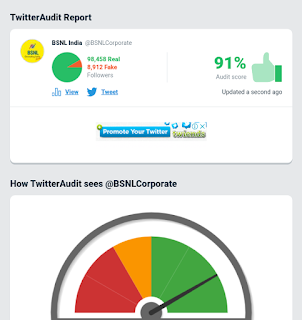 Albeit their followers are less but it was acquired through honest means rather than buying likes and followers like Big 3 Telco of India. This analysis is just an twitter follower audit for these telcos. Wow, that's great news for BSNL & interesting piece of info. When it comes to Twitter automation the first tool that strikes in my mind is https://wizugo.com/. I have used various tools and websites to automate my Twitter account, but no marketing tool can compete with the results that I got with Wizugo. All thanks to Wizugo. It made my all day work easily as now I don’t need to pay most of my time on Twitter because Wizugo has got my back now. Tagline of Water Purifier brands. all copyrights reserved.. Powered by Blogger.